WOW: "When I Was A Child"
Childhood is one of the delighted times in one's life. Where riding a bicycle was fun, sitting on the window seat had its own pleasure, saving money in your piggy bank, no tussle to get up and go to work, playing with a balloon. All these simple and subtle things made childhood more beautiful and full of giggles. Last weekend we asked you to reminisce about your childhood days with our WOW prompt "When I Was A Child" to celebrate the colours of this period in your lifetime. Our bloggers yet again shared their childhood tales wholeheartedly. We were really happy to read your beautiful stories of the innocent days. Thanks for sharing and congratulations! Thank you for your wonderful contribution this weekend. We look forward to many more in the future. 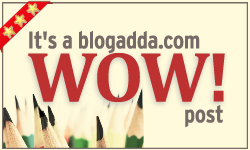 Here is the WOW badge that you can put up on your blog proudly!